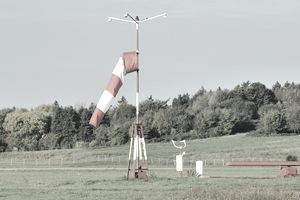 The windsock, a timeless fixture at every airport, offers important information to pilots. It's necessary for an airplane to land into the wind and avoid landing with a tailwind. In addition, all aircraft have a maximum certified crosswind component—a wind speed at which flying becomes hazardous above a certain crosswind component. As such, it's important for pilots to have a quick and easy way to determine the wind speed and direction before landing—like the windsock. Most windsocks are made to orient themselves against the wind when the wind speed is greater than three knots. At a wind speed of 15 knots and greater, the windsock will be fully extended and pointing the opposite way the wind is blowing. (If the tapered end of the windsock points to the north, the wind is coming from the south.) With this knowledge, you can assume that if the windsock is half-way extended, the wind might be about 7 knots. At some uncontrolled airports and airfields, the windsock is the only indication of what the wind is doing. Most airports also have an automated weather observation system (AWOS) or an automatic terminal information system (ATIS), either of which will offer a wind speed and direction data from an anemometer or sensor located on the field. Knowing the location of the anemometer or other sensors on the field, in conjunction with the windsock data, will help you determine the wind direction and speed at different locations on the field.